I bought a couple of really cute swimsuits for my missy this year from Gymboree. One of them ended up being way too short in the torso. I drove into the mall to return a few items and, of course, the swimsuit was on a different order than the other items and I didn’t have the receipt. Since the store only wanted to give store credit (and less than $10 for the suit,) I decided to keep it and either bring it back with the receipt or fix it myself. Of course, I never made it back into the mall and since she needed another suit for our upcoming vacation, I opted to turn it into a tankini! It’s been on my to-do list to sew her a custom swimsuit and I do have all the supplies (including the most gorgeous swim suit fabric,) but I just haven’t got to it yet. This is a super quick and easy project! And it just feels great to take something that didn’t fit and turn it into something useable! Basically, you just cut the swimsuit in half, add a bit of elastic and Voilà… A new tankini! 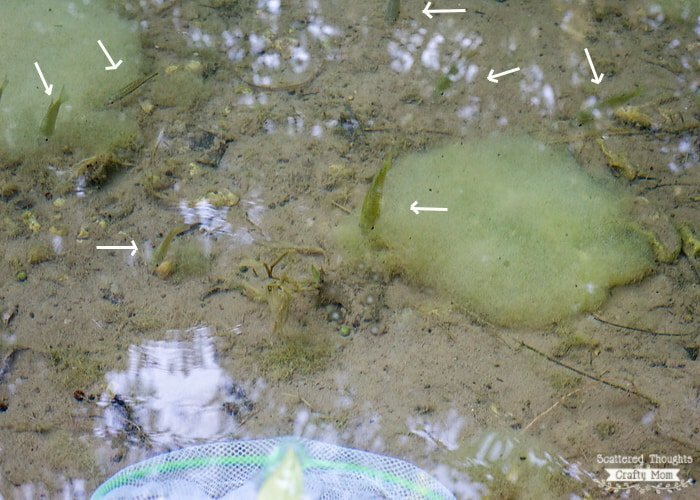 I was walking through our little creek bed recently and could not get over how many tadpoles there were! 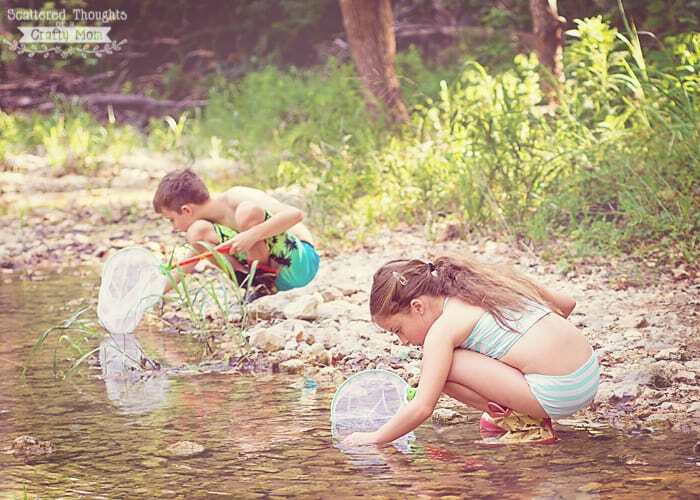 I grabbed these little nets at Walmart and we were tadpole hunting warriors this afternoon. (My legs and back are even a little sore from all the bending over and squatting!) BTW, walmart has all the summer stuff on mark down right now. I even found a little plastic container for the tadpoles to live in. 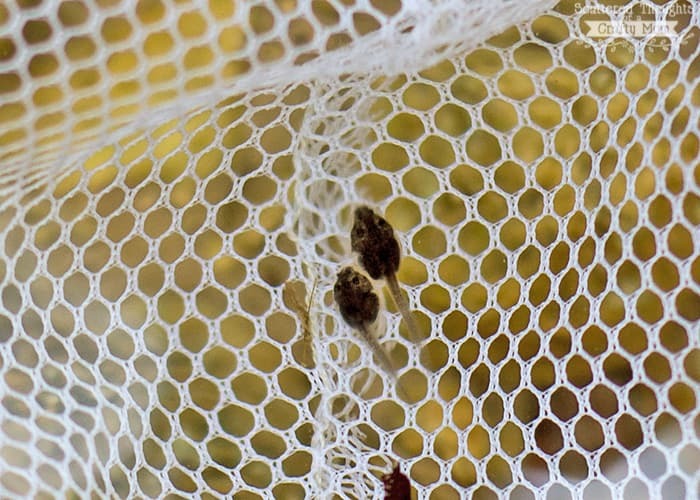 Tadpole tip of the day: Make sure you have fish food on hand and immediately start feeding your tadpoles. Otherwise they will eat the only other thing in the tank… Each other! With this alteration method, the suit barely lost 3/4 to 1 inch in length, so you can imagine how short it was before I cut it apart! Really, the only boo boo I made in this project was to cut the suit apart with scissors instead of my rotary cutter. The bottom is just a bit wonky, but luckily you can’t see any wonky-ness when the suit is on. So if you don’t have a rotary cutter, mat and ruler set yet, you really need to add that to your must have list. Here is the link to a great starter set: Rotary Cutter, mat and ruler. If you can afford it, I do recommend a larger mat. His shorts came from Gymboree. If you already have a bikini or tankini bottom to compare with- this will save quite a bit of guess work. Otherwise a good rule of thumb, would be to divide the body of the swimsuit in to thirds and make your cut there. If you are using a tankini bottom to compare, raise the cut line 3/8 inch to account for the elastic. Go ahead and make your cut. 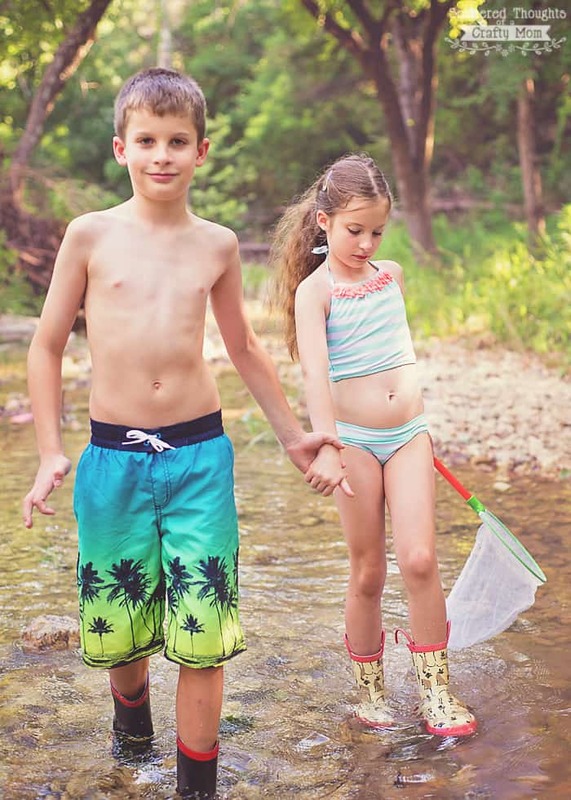 Measure around your child’s hip (where the top of the tankini bottoms will sit) and cut a piece of elastic to that measurement, minus one inch. Measure around the upper waist (where the bottom of the tankini top will sit) and cut a piece of elastic to that width, minus 1 inch. 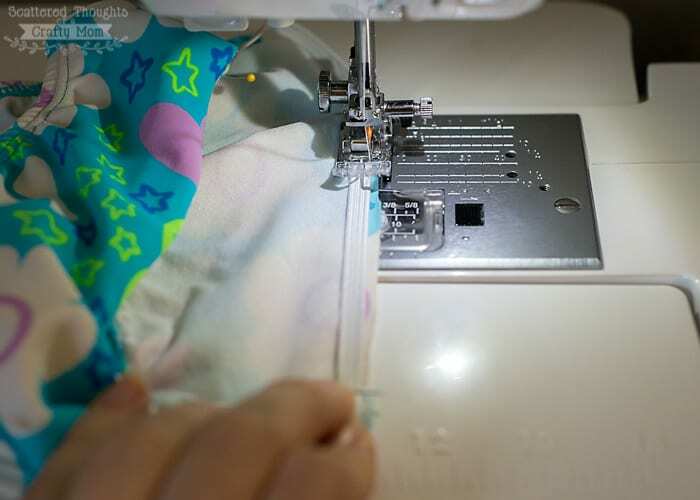 Overlap the elastic edges by 1/2 inch and sew together. 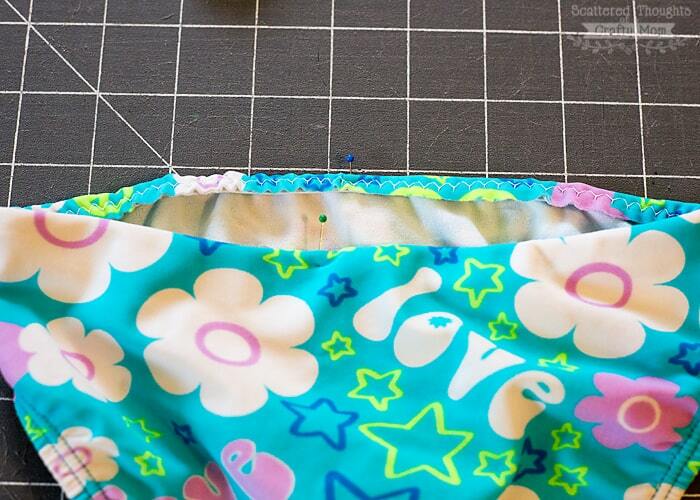 Divide the elastic and top of the tankini bottom evenly int fourths and mark these spots. 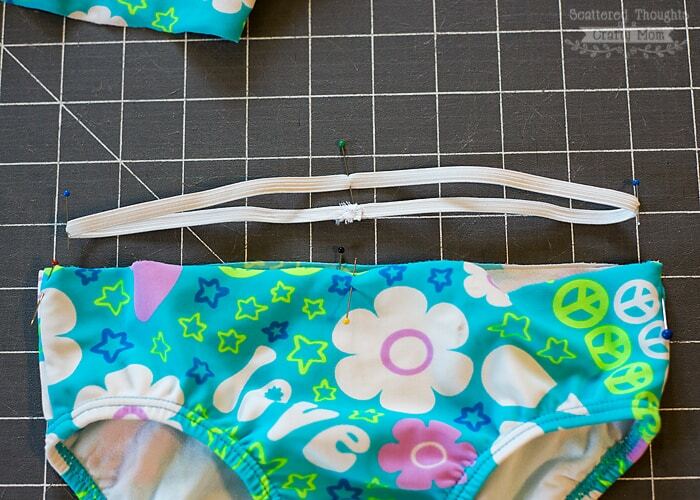 Line up the marks and pin the elastic right along the top edge of the tankini bottom. 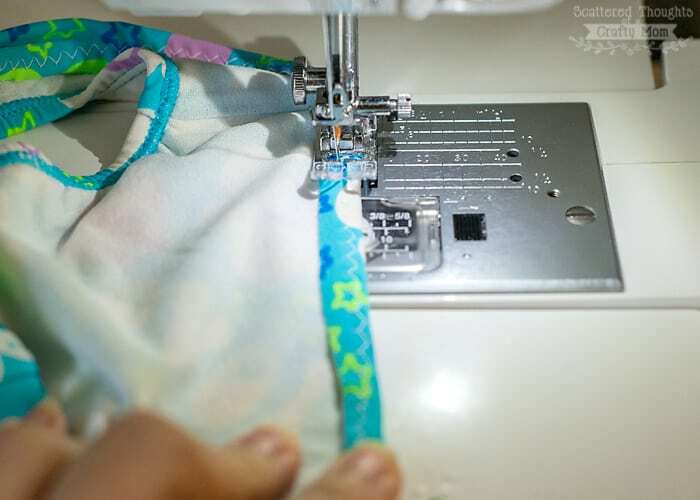 Sew the elastic to the swimsuit, using a long wide zig zag stitch, stretching the elastic as you go to fit the bottom, but be careful not to stretch the bottom fabric. 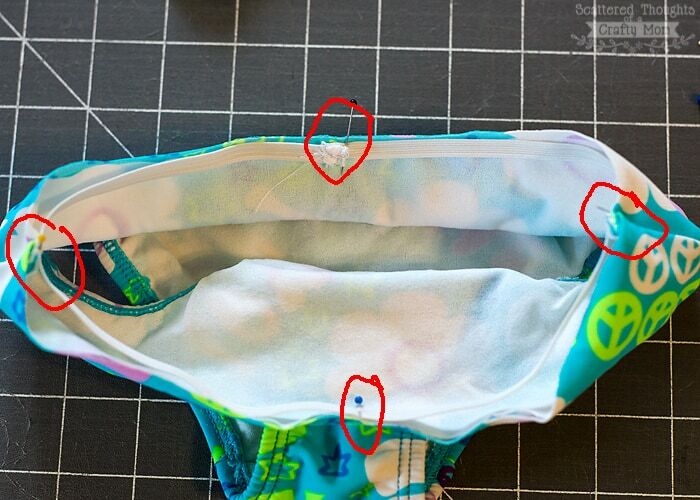 Flip the elastic to the inside and pin. 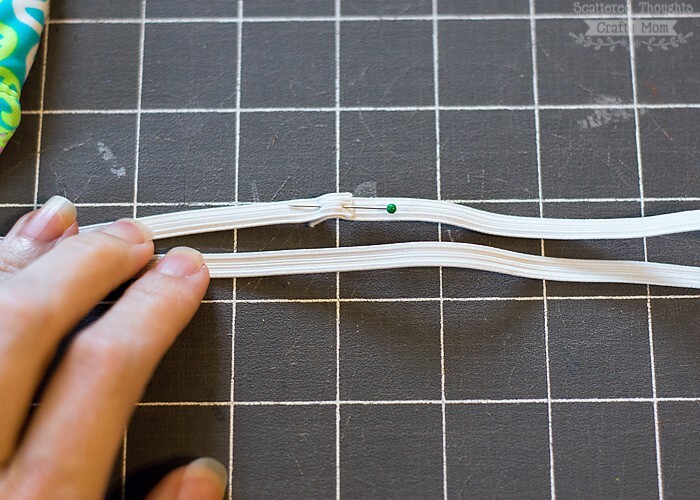 Sew a long wide zig zag stitch right through the elastic. That’s it! Repeat this process with the tankini top and admire your now properly fitting tankini! Now, I’m definitely ready to dive into making a swimsuit! 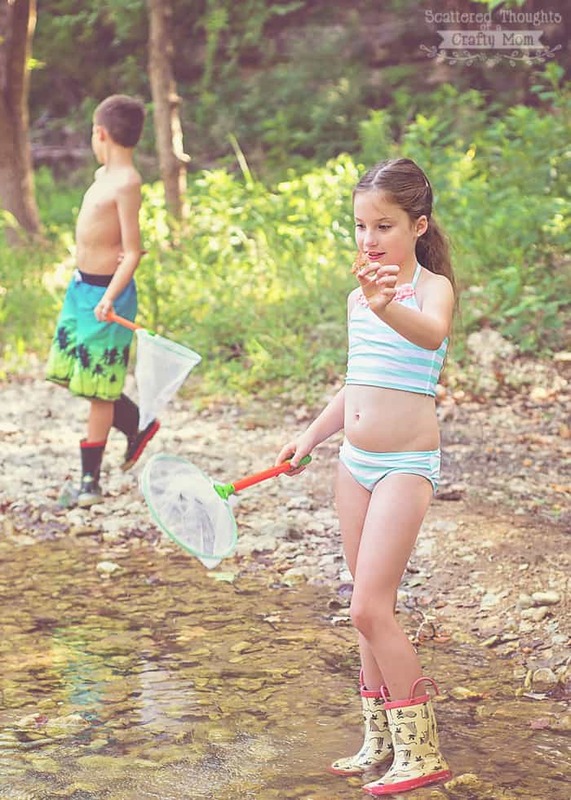 Have you sewn a swimsuit yet? Want more sewing tutorials, patterns and inspiration? See my most recent projects here. 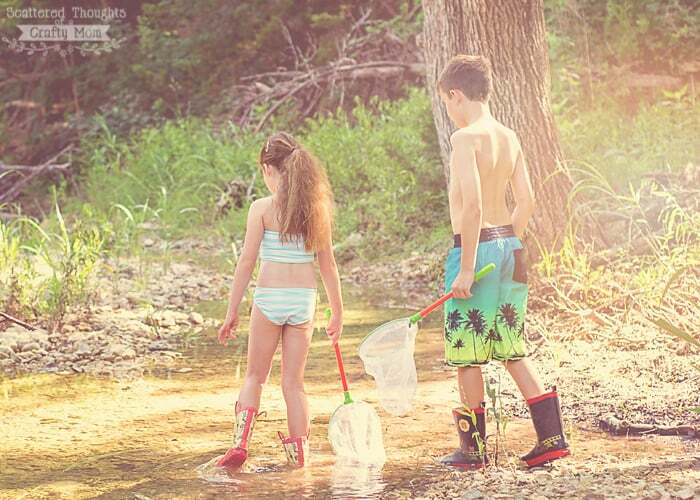 This is such a great idea… It seems like each year the swimsuit would get too short but still fit otherwise. Perfect way to fix it. Cute pics of the kids too. Thanks Bernie, we all had a pretty good time with this one! 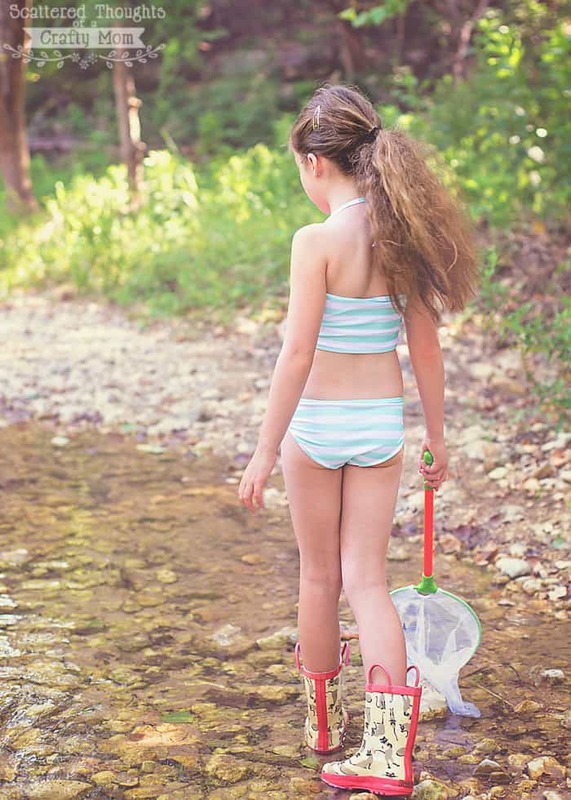 Like you, I wanted to make my daughter a custom swim suit, but haven't found the time. 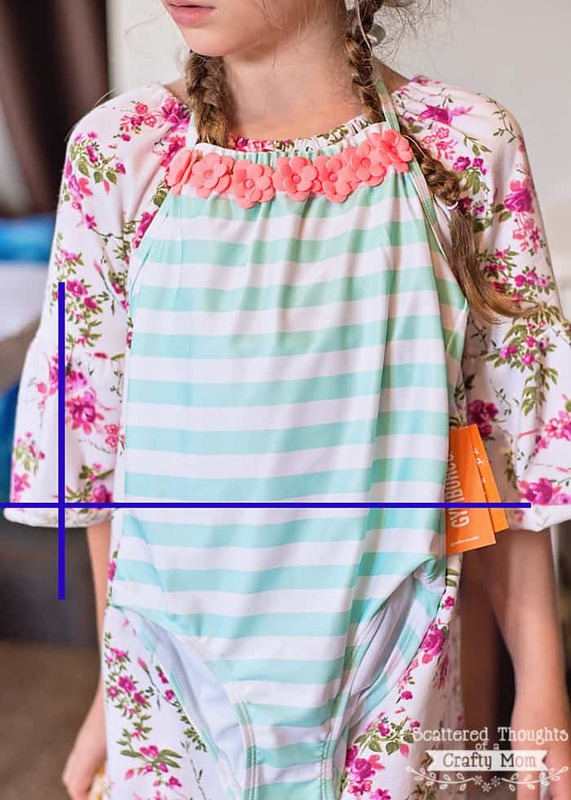 I did something similar for my daughter's swim suit this year (if you want to see, http://thesewspot.com/bathing-suit/), but I love the way you attached the elastic. I will definitely do it that way next time! This is brilliant! I have been wanting to make myself a custom swimsuit. I'm thinking this method would apply to women who deal with summer pregnancy instead of having to pay a lot of money for a new "maternity" suit. I had never seen elastic done that way either! Loved the tutorial. What a great idea! Will definitely give it a go! Thank you! Oh my gosh this is so helpful. I’be recently lost a little over 30 pounds and would like to find a high waisted bikini for myself or something in a fun colorful print instead of hiding in black for once. I can’t find two pieces that I like at a good price, so I got a brand new one piece with a beautiful floral print from eBay for very cheap…but the torso is too short!! After reading this I feel like I can definitely handle cutting it in half and making a fabulous high waisted bikini. Thanks so much! Hope this helps! Definitely consider a slightly wider elastic for adult sizes.